Ask the Expert – What are the differences between the Series 1950 and 1950G Explosion-proof Differential Pressure Switches? 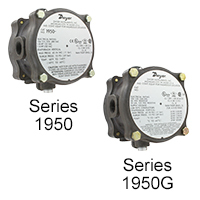 Question: What are the differences between the Series 1950 and 1950G Explosion-proof Differential Pressure Switches? Answer: While the Series 1950 and 1950G Explosion-proof Differential Pressure Switches share many similarities, each are used for different applications. Both instruments are an explosion-proof differential pressure switch. However, the Series 1950 is intended for air and non-combustible compatible gages, whereas the 1950G is for air and combustible compatible gages. Additionally, natural gas can be used with the 1950G, but not with the 1950. Because the snap switch is mechanically coupled to the diaphragm inside of the sensing chamber, the 1950 does not require power. This also explains why the 1950 should not be used with combustible gases, as the snap switch is not hermetically sealed and might ignite the process media when arcing. The 1950G, on the other hand, requires power in order to actuate the electro-magnetic coupling mechanism inside the switching chamber because the snap switch is isolated from the process media. Dwyer has several ranges readily available to meet your application’s requirements. Please remember, it is always recommended to review a product’s complete specifications to ensure compatibility with the application’s requirements. This information and more can be found on the Dwyer website.